B+W UV 010 also known as protection filters. It protects your lens against dust, flying sand, sea water spray and the like. UV Filters are ideal for photography in high altitudes (in the mountains), by the sea and in regions with very clear air. The pictures gain brilliance and disturbing blue casts are avoided. Because the glass is colorless, color rendition is not changed, aside from the elimination of the unwanted blue cast, and no increase in exposure is required. 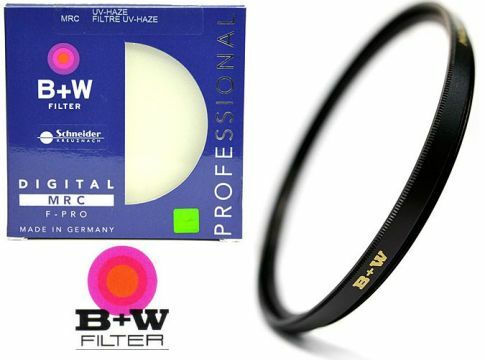 It is recommended as an ideal filter to be kept permanently on the lens for protection. This filter uses our standard B+W F-Pro filter mount, which has a front accessory thread and is made of brass. F-Pro mount can be used with wide angle lenses, including most 24mm focal lengths on a full frame body, without vignetting. Another advantage of the F-Pro mount is it's modified retaining ring, which is no longer threaded in from the front, but holds the filter glass in place from the back. 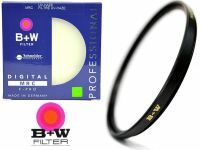 When removing a filter or lens hood that has been screwed on too tight to the filter, the retaining ring is not at risk of loosening. MRC by B+W is not only an extraordinarily effective multiple layer coating, it is also harder than glass, so that it protects filters from scratches (for instance when cleaning the filters), and it is also water and dirt repellent, thus facilitating filter maintenance. Tas Kamera Indonesia Official Dealer Fujifilm Indonesia, Instax, National Geographic, Crumpler, Manfrotto, Gariz, KATA dan berbagai macam brand lainnya.